Canada's only human 7Tesla MRI, located at The University of Western Ontario, has scanned its first clinical research case. A patient with temporal lobe epilepsy was put through the scanner to study whether it can be used to better pinpoint where seizures originate. The 7T scanner provides images of the brain with much stronger resolution and contrast compared to common 1.5T MRIs found in most hospitals. "Approximately 30 percent of patients with focal epilepsy cannot be controlled with medication," explains Dr. Jorge Burneo, Associate Professor of Neurology, Epidemiology, and Biostatistics at Western's Schulich School of Medicine & Dentistry and a neurologist in the Epilepsy Program at London Health Sciences Centre. "Half or more of these cases involve the temporal lobe, which controls language, hearing and smell. We are investigating whether the 7T scanner will reveal the region where seizures originate for surgical intervention. It's our hope that in the future, this may decrease the need to use intracranial electrodes which carry an element of risk." In his study, Dr. Burneo is planning to initially scan 10 patients with temporal lobe epilepsy where a 1.5 MRI failed to locate the origin of the seizure. Along with the anatomical images, the 7T scanner provides metabolic measurements using magnetic resonance spectroscopy (MRS). Robert Bartha, an imaging scientist at the Robarts Research Institute and a professor in Medical Biophysics says metabolic measurements are potentially more sensitive to the presence of disease than structural changes and could help in early diagnosis. 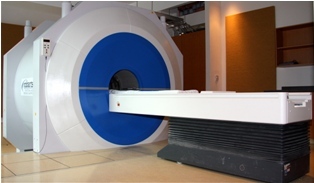 Along with assisting on the epilepsy study, Bartha is now also using the 7T scanner to study the metabolic and structural changes in the brain in subjects with Alzheimer's disease. He scanned a subject with mild cognitive impairment just a couple days after the first clinical research patient went in it. The 7T magnet arrived at Robarts two years ago and a group of dedicated and highly skilled scientists and engineers have been working since then to develop the specific hardware and software necessary for clinical research. "This kind of scanner is not out-of-the-box, ready-to-use. It's been a lot of technically difficult work to get us to this point." says Bartha. "We're very excited about the research possibilities." Medical imaging and neuroscience are signature research areas at Western.